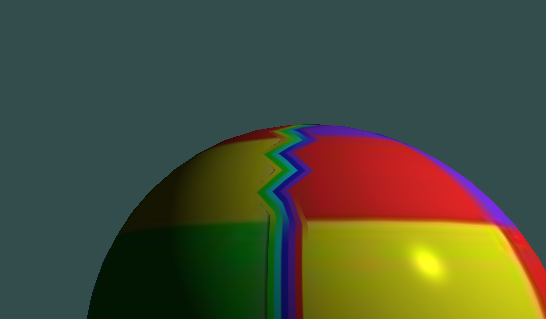 I am trying to generate UV coordinates automatically to map a texture on a sphere. The problem is with seams when going from 0.8 to 0.2 there is a discontinuity and interpolation in fragment shader is incorrect. It should go from 0.8 to 1 and then from 1 to 0.2. But instead it will interpolate directly between 0.8 to 0.2. How to handle this discontinuity from 1 -> 0. Make the 0-1 discontinuity explicit in the mesh. That is create a 2 sets of vertices that lie exactly on the line where the value would be 1 or 0 (one set gets 1 and one gets 0) then connect the vertices up like they would makes sense. Switch to a different texture mapping projection, I prefer a cubemap because it minimizes distortion at the poles and you don't need to have seams in the mesh. Not the answer you're looking for? Browse other questions tagged opengl shader texture uv-mapping directx or ask your own question.